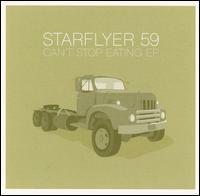 The best thing about Starflyer 59 is that they are the ever-evolving band that just keeps getting better. They are one of the original Tooth and Nail bands and one of the best. Over the years their brand of heavy guitars and hushed vocals has gradually mellowed into a delightful Brit-pop sound with “Leave Here A Stranger” (left), which has continued to establish the band as one of the most creative in the Christian scene and beyond. I recently did an e-mail interview with Jason Martin, the man behind Starflyer’s music. It’s hard to describe him, but the word “Rock Star” is definitely not in his vocabulary. He doesn’t seem to really have much to say outside of his music, but most of the time music can say more than an interview anyway. Matt M: Last summer before your show at Cornerstone there was a guy who proposed to his girlfriend. He talked about how Starflyer was his favorite band and how he was so excited that he found a girl that loved Starflyer as much as he did. Did he talk to you beforehand to set up the proposal and what was your reaction when he was proposing? Jason Martin: Yeah, he was a friend of ours and asked if he could propose on stage. I thought it was cool and I also thought he has a lot more guts than me. MM: I heard that you met your wife while shooting a video for “A Housewife Love Song.” Is that accurate and if so can you tell a little bit of the story of how you ended up together? Martin: I had known her before that. She worked around Tooth and Nail in the early days and was dating someone else. They eventually broke up. We did a video, started dating and were married 6 months later. MM: You used to be in a band called Morella’s Forest and there is band from Ohio that also goes by that name. In another interview, your brother Ronnie told his side of the story, what’s your side of the story and did their use of your old band’s name bother you? Martin: Not at all. At the time I thought it was kind of weird these guys I didn’t know took this obscure band name that happened to be ours. I actually came up with that name when I thought I was a deep 15-year-old. There was a poem, or short story by Edgar Allen Poe called “Morella” and a Cure song called “A Forest”…so there you go. MM: Musically after Dance House Children, you and your brother Ronnie had a parting of sorts; each of you choosing to pursue a different musical direction. Why did the two of you decide to go your own ways artistically? Martin: It just kind of happened. I’ve always liked guitar type stuff the best, probably because it’s easier to start. The idea of sequencers and programming really scared me when I was younger, so to do a more standard rock and roll thing when we separated made sense to me at the time. MM: Can you give a run-down of the history of current and former members of Starflyer 59? Also why did Wayne Everett leave? Martin: That’s a little confusing to me…Here are the basics. It was Andrew Larson and I in the beginning. Then it was Eric Campuzano, Wayne Everett and I. When Campuzano left, it was Cloud, Everett and I. About that time Wayne and Eric started a band called “The Lassie Foundation”. It became apparent that Wayne had some more important obligations with his new band; there were no hard feelings-that’s just the way it was. The lineup became, and still is, Cloud, Joey Esquibel and I.
MM: You always seem quite shy and soft spoken, and you’ve said that you don’t like being up on stage. Is that a fair assessment of your personality or is that just how you are in public? Martin: I’m not shy around my close friends, but yeah, I don’t just love playing shows, it just goes with the territory. You work hard on making records and to promote the records you have to tour. I’m more comfortable with playing live now more than I’ve ever been, but it still at times seems a bit unnatural considering I know who I am, and I stand in front of people singing and playing guitar. MM: You said that you’re not a poet, but a lot of people seem to think you are. Why do you think people think you’re a poet and why do you think they’re wrong? Martin: I just write songs, some better than others. MM: Your producer and friend Gene Eugene passed away a couple years back. Can you share a little about what he means to you as a musician and a friend, and how you will remember him? Martin: Nothing really to say, he helped us out a lot, helped transfer the band into the band we are now. He was my friend and I miss that guy on a continual basis. MM: You worked with Terry Taylor on “Leave Here A Stranger.” Was that weird working with him since you grew up listening to his band Daniel Amos? Martin: Yeah it was at first. He was one the reasons I wanted to make music in the first place. It was a great time doing the record with him; it was nice getting to know a guy that had such a big influence on me musically and spiritually. MM: The lines from one of your songs say: “When I learn to sing I’ll change the key of everything. When I learn to read I’ll change my views on everything.” Is that meant to be literal or metaphorical and do you think that the average listener understands the meaning of your songs? Martin: The singing part was literal!!! I think the songs mean what they mean. MM: Can you give a preview the new Bon Voyage album, as far as what listeners should expect in comparison to the first Bon Voyage record? Martin: I think it turned out cool. It is a little smoother than the last one. There are some nice numbers on it and Julie’s voice sounds great. MM: What’s the new EP “Can’t Stop Eating” (right) going to be like? Musically how will it compare to your previous recordings? MM: Do you ever feel that Starflyer being part of the “Christian” music scene causes people to discriminate against your music or to write it off as religious propaganda before giving it a fair listen? Martin: No, we’ve never really had any problems being a Christian band, it seems like we’ve always gotten a fair shake. MM: You were nominated for a music award in Orange County and you’ve received praise from music critics from publications like the L.A. Times. How do you handle that and what do you hope that people remember about you and your music? Martin: I think that’s nice. I hope we’re remembered the way I remember bands like Daniel Amos, it made me want to be in a band and make music. That’s when it really was fun. MM: Any last words, thoughts, comments or suggestions? Martin: Thanks for the interview. For more information about Starflyer 59 click here.